I picked this up at a little free library recently, and I'm really excited to dive in! It looks kind of like The Da Vinci Code, which I really enjoyed. OKAY, CAN WE ALL TAKE A MOMENT TO COLLECTIVELY SWOON ABOUT THAT COVER? And the title, ahhhh. 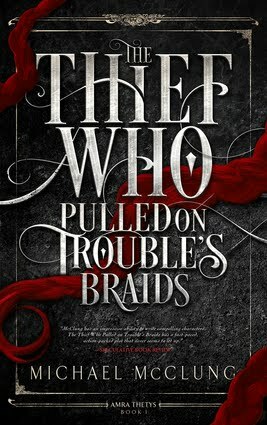 I hope to get to this one pretty soon; I'll probably download it after I finish The Girl Who Fell Beneath Fairyland and Led the Revels There by Catherynne M. Valante. I LOVE BOOKS WRITTEN IN THIS STYLE. 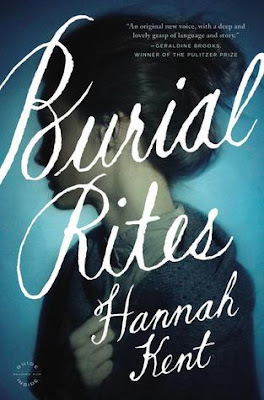 (Think When the Moon Was Ours and The Walls Around Us) Plus, Burial Rites takes place in Iceland. I love that country and have never read a book set there. I originally wasn't going to read this as the concept doesn't really interest me. However, the writing looks pretty compelling, and I received a copy for my birthday. Might as well give it a shot! This is another book that looks both beautiful and breathtaking. 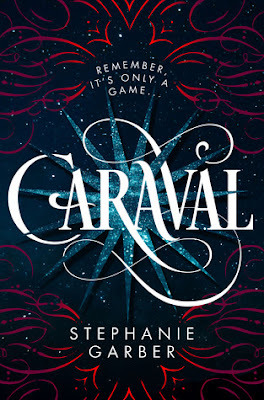 My best friend read it and absolutely loved it, so on my TBR it goes! 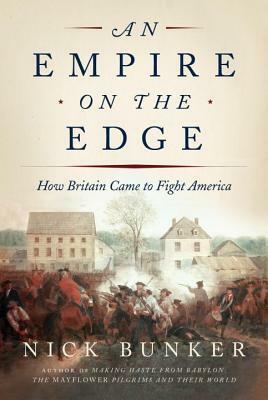 I read a lot of Revolutionary War books, but I've never read one written by a British author before. It'll be quite interesting to see the Revolution from a Brit's point of view! I hope so! I don't have really high expectations, but it looks like it'll be a fun read. The Giver is really good! 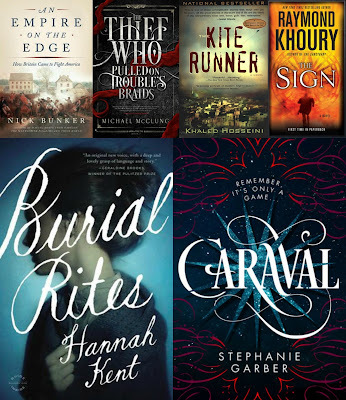 OMG YES I'VE WANTED TO READ BONE GAP FOR FOREVER. 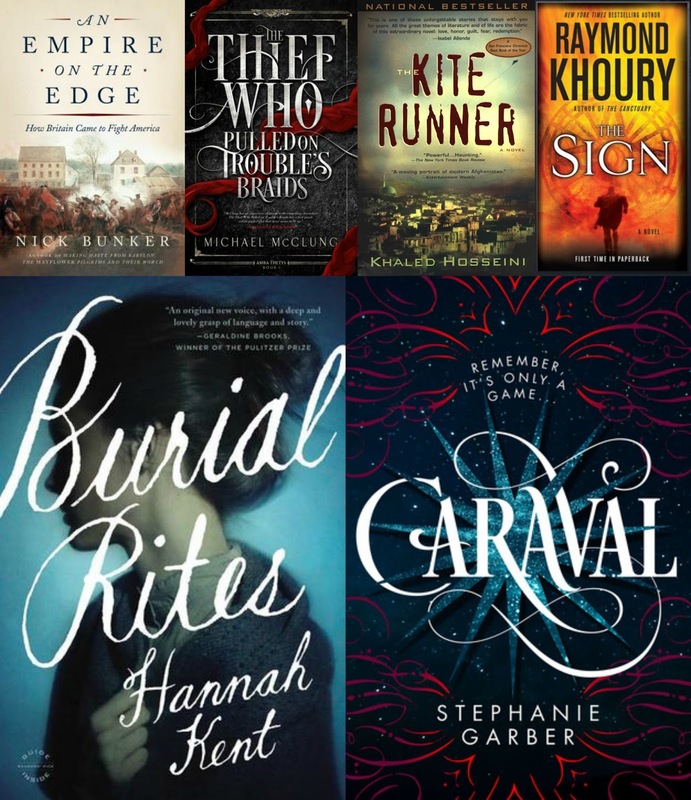 Carnaval and The Kite Runner are two books that I really want to read, as well! 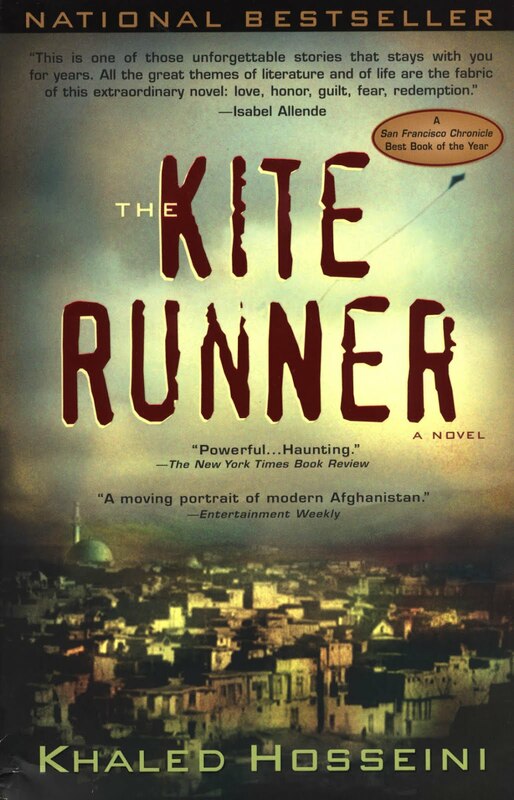 I'm kind of iffy about the former, but like you, a ton of my friends loved the Kite Runner. I've heard mixed reviews about Caraval - don't really know if i'll pick it up, but I guess time will tell. 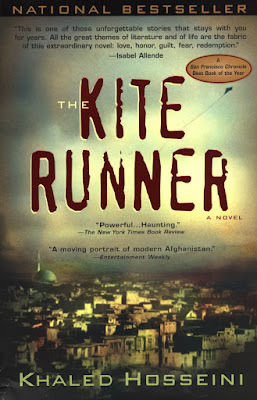 THE KITE RUNNER IS AWESOME READ IT! 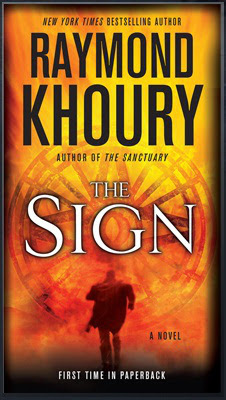 My mother recommended it to me (because my mother knows the best books) ad I fell in love with it. AHHHHH YES I MUST. I actually own a copy, so I'll probably get to it sooner rather than later. You're reading some Fairyland right now? Yes!! I wasn't a huge fan of the first book, but I'm in love with the second. Do you know how much the fourth ties in with the rest of the series? I'm wondering whether or not I can or should skip it. I hope I enjoy it as much as you did!